Oz Griebel and his running mate, Monte Frank. Earlier this month, 83 percent of voters didn’t know enough about him to offer an opinion to a pollster, and his last campaign finance filing showed him with just $12,624 in available funds. 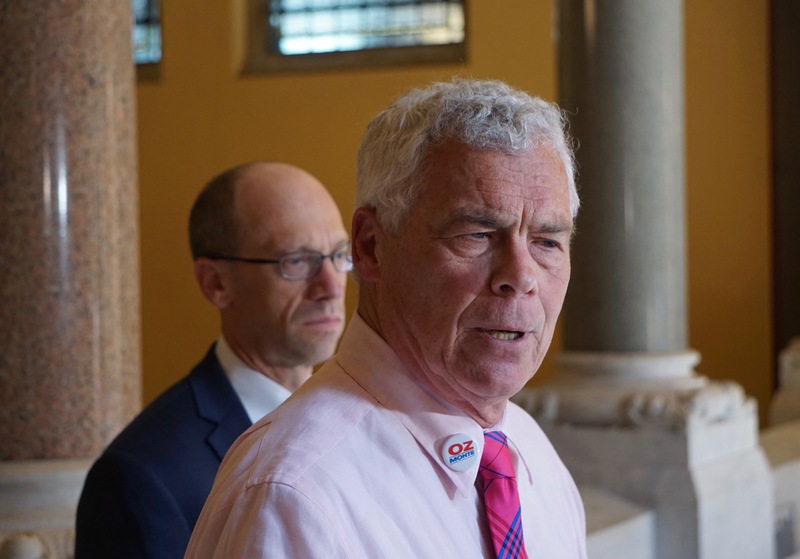 But Oz Griebel is now on the ballot as an alternative to a Democrat or Republican as the next governor of Connecticut. “That’s the step this week,” Griebel said Wednesday, a day after the secretary of the state’s office had certified him as qualifying for the ballot by submitting signatures from at least 7,500 voters. The question for Griebel and his running mate, Monte Frank, is how big a step. It’s time to see if potential donors now pay attention, if the invitations to debates and forums come and if lightning strikes — a seminal event that gives Griebel and Frank a moment that connects them with disaffected voters. If there exists a third-party Zeitgeist in Connecticut in 2018, the self-branded team of Oz and Monte has yet to find it. 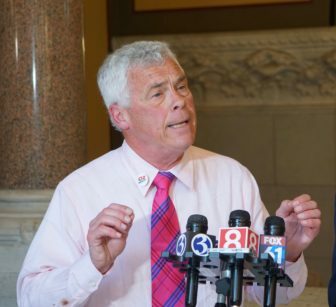 Griebel is participating in the first debate of the general election, an economic and fiscal forum Sept. 5 at the University of St. Joseph sponsored by the Connecticut Conference of Independent Colleges, with Connecticut Public Radio, WFSB, Channel 3 and CT Mirror as media partners. Democrat Ned Lamont is attending; Republican Bob Stefanowski is not. Griebel, 69, is fluent in public policy questions, recently retired as president of the MetroHartford Alliance, the region’s largest business group. He ran for governor in 2010, finishing third in the Republican primary. More recently, Griebel has served on two panels that studied transportation needs and methods of financing them, a problem he says must be solved to grow the economy. Frank, a lawyer with Pullman & Comley, is the recent past president of the Connecticut Bar Association. They are talkers — Griebel a marketer, Frank a litigator. Griebel played baseball at Dartmouth and, briefly, in the St. Louis Cardinals farm system. Frank is a bicyclist who mixes politics with long-distance rides — to Washington from his home in Newtown, scene of a horrific school shooting, to promote gun safety or across Connecticut for a campaign fundraiser. They have at least one of the prerequisites necessary to run for office as anything other than a major party candidate: An ability to look voters and reporters in the eye, tell them they are credible candidates, and not seem deluded — even if they have four points in the Quinnipiac poll and 12 grand in the bank. Griebel tells reporters there is a book to be written if they win, an assertion he never makes without a broad smile. More seriously, Griebel says qualifying for the ballot is a significant milestone, not necessarily game changing, but a step nonetheless to a more serious conversation with voters. As of July 1, the campaign had raised $138,958 from people not named Oz. With about $70,000 from the candidate, the campaign was able to spend $208,034. They have their moments of encouragement, small though they may be. Their major-party opponents are businessmen promising tax relief. Stefanowski says the state can eliminate the income tax over eight years, while Lamont wants to restore and expand a once-hefty property-tax credit that has all but disappeared. Neither man talks in detail about how to first address a projected first-year deficit of $2 billion for the next governor. Conventional wisdom once held that Griebel, a businessman and former Republican, would rob votes from Stefanowski. But he is socially moderate and closer to Lamont on some issues, such as tolls, and the Quinnipiac poll showed him hitting Lamont a little harder than the Republican. In a two-way race, Quinnipiac showed Lamont leading Stefanowski, 53 percent to 37 percent. With Griebel in the mix, Lamont lost seven points, dropping to 46 percent; Stefanowski lost four, falling to 33 percent. (A Sacred Heart University poll, which ignored Griebel, had Lamont’s lead at four points.) Other candidates are awaiting word from the secretary of the state’s office about their petitions for a place on the ballot. Oz and Monte have a brand, their distinctive first names. Oz has a popular-culture hook, though not the one that takes dreamers over the rainbow to a technicolor world. It’s a black-and-white sitcom that went off the air in 1966, “The Adventures of Ozzie and Harriett” — the Nelsons. The candidate’s full name is R. Nelson Griebel, and someone tagged him as Ozzie, which eventually became just Oz. Oz and Monte are trying a take-your-medicine approach to some of Connecticut’s significant fiscal challenges, betting there is a reward in treating voters as adults who know there is no Santa Claus, that bills are coming due and must be paid. The state’s creaky and underfunded transportation infrastructure? Promises by Republicans and Democrats to cut taxes? C’mon, the state is facing a $2 billion deficit next year. Americans tell pollsters they are open to third-party candidates. Gallup found 71 percent of millennials in favor of a third-party movement last fall. But the track record for individual candidates is dismal, with notable exceptions that typically involve a well-known political figure bolting the Democratic or Republican parities, often from necessity. Lowell P. Weicker Jr., who served three terms in the U.S. Senate as a Republican, won a three-way race for governor of Connecticut as an independent in 1990. Joseph I. Lieberman, the Democrat who beat Weicker in a Senate race in 1988, was re-elected as an independent in 2006 after losing the Democratic primary to Ned Lamont. Griebel and Frank have a bumper sticker slogan: “No politics. No parties. Just solutions.” But for all their straight talk, they lack a single rallying point. Griebel says an independent governor is needed to act as an honest broker, someone capable of bringing together disparate groups in common cause. That’s a promise of process. They’ve got 10 weeks to sell it, they’re on the ballot, and a woman in Sharon has adopted them.